Last year my grade 1 students were uploading videos to their personal blogs and to youtube, tweeting from our classroom Twitter feed, face timing, skyping and participating in Google Hangouts with peers, soon to be teachers, teachers, experts in a certain field, and the class down the hall. We participated in global projects like the Global Read Aloud and created our own global projects. There are many great reasons why we have embeded social media into our daily classroom routines. The two most important to me are, the increased excitement and engagement I have experienced in my students and because I think it is imperative that we model appropriate digital citizenship at a young age. I am in charge of a Primary Blogging Network that started this past Monday. There are approximately 80 classes, grades K-3 from around the world participating in this project. The classes are put into groups and they are currently visiting and commenting on classroom blogs that will eventually turn into visiting and commenting on student's individual blogs in a few weeks. Yesterday I received information from a teacher that a child was writing inappropriate content on her class blog. Luckily, she moderates the comments before anyone sees them so there was no harm done. At first, I was mortified. Many times we jump to conclusions and put blame on the teacher. "Well, if the teacher had been paying more attention...." or "Didn't they go over blogging etiquette?" First, we all have had a child in our class that pushes the boundaries and is always curious on how far he or she can get without getting caught. Think about it in a positive light. This is a wonderful teaching moment! This 2nd grade child that was writing inapprorpriate words in all of his comments needs a refresher in digital citizenship. Luckily, he is 7 years old and this is a minor issue that resulted in no harm done. We know exactly who it was and he will learn a valuable lesson. One that will hopefully remind him in the future to think before he posts something online. We all know a story about a teenager, posting a picture or video or writing something inappropriate on a Facebook page, or texting someone something that they can't erase. The ramifications of those mistakes are far worse as you get older. I want my students to learn about these things now, in our classroom with my guidance, so they don't make those mistakes when it could seriously hurt someone or themselves. My students use Twitter almost everyday. 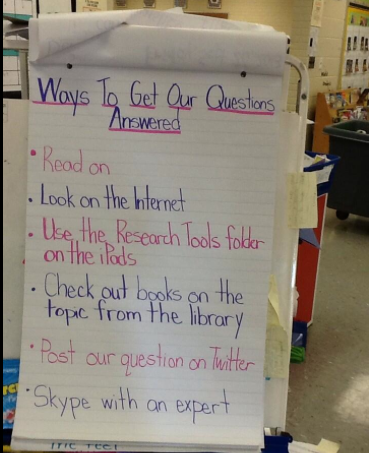 They see Twitter as an educational tool that enriches our learning environment. My students don't see it as a place to follow teen idols or to post garbage to their friends. I hope that as my students get older they will continue to use Twitter for a significant purpose because they have only been exposed to it in that way. My students already have created a wonderful personal learning network where they share their learning and use social media as a way to answer questions. Thank you for this inspiring blog post. You are making me really think about how we can use social media with our students too. I plan to keep checking back to see what you are blogging about next. I am curious to know - what apps do you keep in the Research Tools folder on the iPads? Great article. We are introducing our high school students to proper social media use.